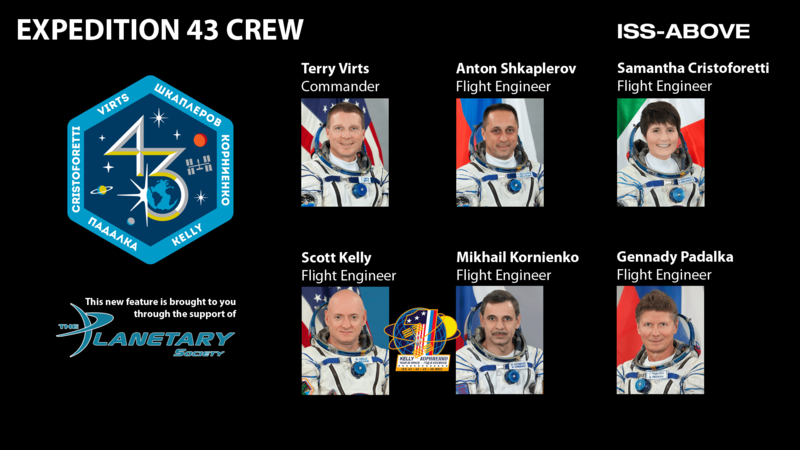 With the launch earlier today I’ve updated the Expedition Info Panel for ISS-Above to now show the full Expedition 43 Crew – with a special reference to the #YearInSpace crew members Scott Kelly and Mikhail Kornienko. 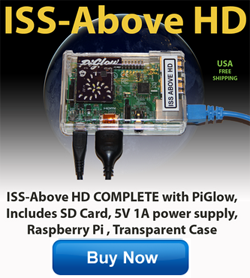 Message to all ISS-Above HD customers – be sure to update your system to get the new info panel. *replace issabove.local with the ip address for your device if you this link does not work. So what are all those blinking lights doing? As the ISS-Above’s are coming online I am getting a few questions about what all the blinking lights mean. Just in case you missed the email attachment or the printed document (in the Complete ISS-Above) here is the information about all that. 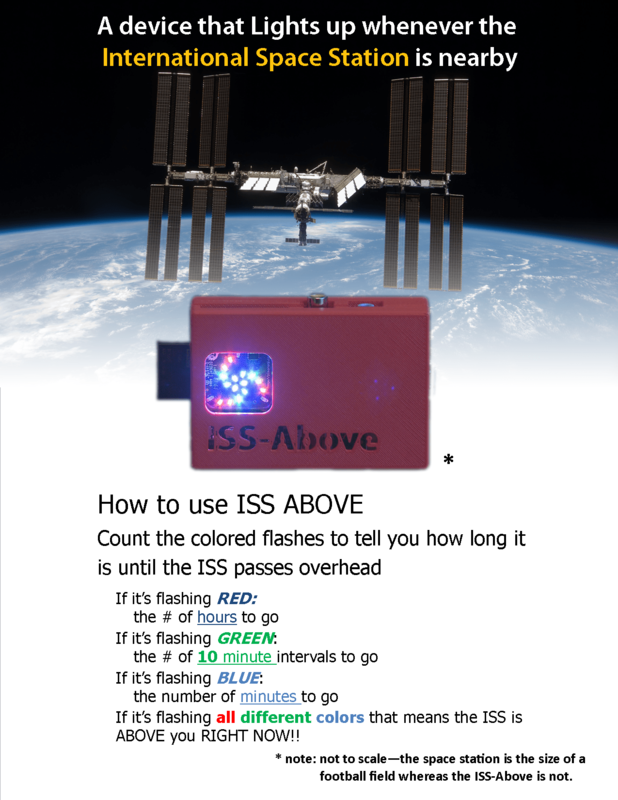 If you have an ISS-Above with a PiGlow / Ledborg / Blinkstick or Blink(1) they indicate an approximate time until the next pass of the ISS by flashing either red (more than an hour) green (less than one hour) and blue (less than 10 minutes). So you want to connect your ISS-Above to Wifi? You have probably seen the two or four USB ports on the device near to the ethernet port. You can purchase a pretty inexpensive WiFi “dongle” that can plug in to one of the USB ports. (note: that issabove.local link only works on some networks – if that doesn’t work you will need to locate the actual IP address of your device. As long as you have a recent version of ISS-Above this will be displayed on the lower left corner of your TV screen). Just configure the ssid and pwd in the file shown and click Save Settings. Note the IP address will have changed when you switch to using the WiFi. If for any reason the connection is not successful please re-connect the wired ethernet cable and check your settings again. 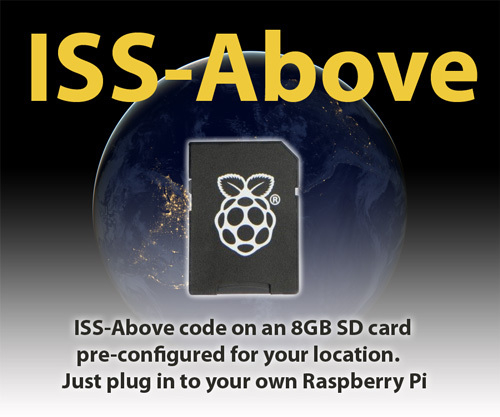 You need to backup your ISS-Above SD Card as SOON as you can. As you will have already found out the Raspberry Pi (the computer at the heart of the ISS-Above) does not come with an on-off switch. Just like any computer – they don’t like it when the power is just pulled from them without doing an orderly shutdown. If the power is lost suddenly this can (sometimes) corrupt the SD card containing the ISS-Above code). The best solution is to clone / backup the SD card to your computer. This will allow you to quickly restore the setup to your SD Card if it ever gets corrupted. This will only take 10 minutes and is HIGHLY recommended (otherwise tears and upset might be in your future). – although you can Zip (compress) the backup file for safekeeping and the file will be about 800Mb in size). If you have a windows based computer follow these instructions. If you have a Mac use these instructions. Backing up your SD card image is the SMARTEST thing you can ever do. This will allow you to quickly restore the setup to your SD Card if it ever gets corrupted. This will only take about 10 minutes and is HIGHLY recommended (otherwise tears and upset might be in your future). You will need 8GB of space for the backup – although you can Zip (compress) the backup file for safekeeping and the file will be about 800Mb in size). I am not a Mac user – so I have no personal experience of the following … but hopefully this will make sense to you. I have heard of two approaches. The first approach uses “command line” tools you enter in the “Terminal” window of the Mac. The other approach uses a free tool called Pi Copier and to backup the card and Pi Filler to write the saved image back to your SD Card. You can download both utilities here. To find out which disk your device is type diskutil list at a command prompt – also, you may need to be root – to do this type sudo -s and enter your password when prompted. This part of the instructions taken from this original article.